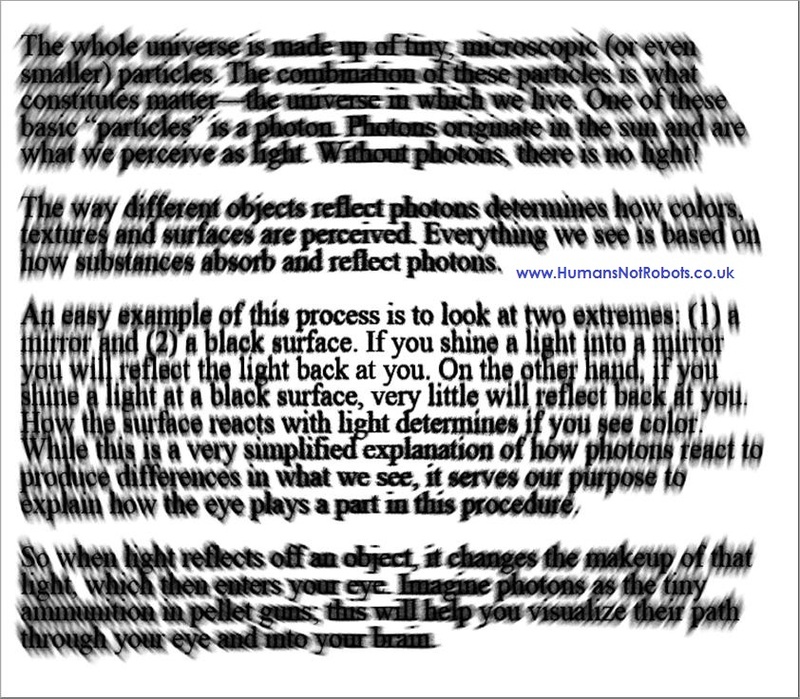 An example of how some readers with Irlen Syndrome experience text. I took time during the Christmas break to go over the learning materials and the notes from a recent Irlen Syndrome course I undertook in October and November 2012 (I am still awaiting feedback on whether I have passed it to become an approved screener). In turn I took to the internet and gathered together, amongst other things, some interesting facts about the human eye. >> Your eye can distinguish 500 different shades of light and 10million variations in hue / colour. >> Your eye has the potential to see a candlelight from 14 miles away. >> Your eye blinks an average of 27000 times per day and 4.2million times a year. >> People generally read text 25% slower on an ICT screen compared to print. 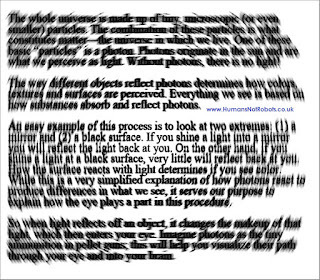 >> Concentrated sight requires about half of the brain's pathways. >> Your eyesight is divided between peripheral vision - designed to track movement with roots in our evolutionary past, and central vision - designed to focus on detail and a defining part of our make-up as homosapiens. >> Males are reported to be typically more able to distinguish finer detail than females. >> 20/20 vision is normal vision, not higher than average vision. >> A fingerprint has 40 different unique-to-you characteristics whereas an iris has 256 unique-to-you characteristics, hence the growing use of iris scans for security purposes. >> 80% of visual impairment worldwide are avoidable or curable - a leading charity working to alleviate these problems is Sightsavers International.